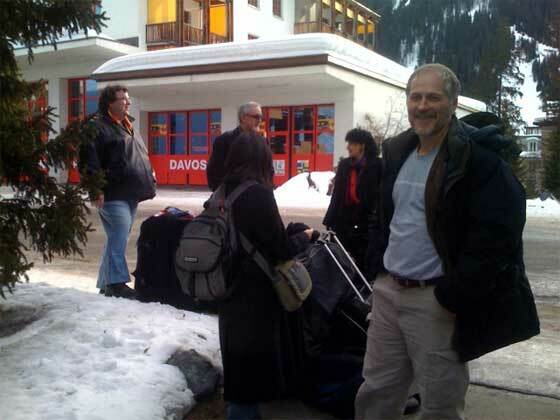 I wrote a week ago that I was negotiating to get on the Google plane back from the Davos conference to the Bay Area. One exec said it was looking good, another said they’d try to get me on. But so far, nothing. The plane leaves in about twelve hours and no official invitatation has come. Meanwhile, I’ve heard that Tim O’Reily, Mitch Kapor, Reid Hoffman and Mark Zuckerberg will be on that flight. Basically, every Davos attendee from the bay area except me managed to hitch a ride back with Google . The plane seats 25 people with a full bed, I’ve been told, and is now completely full. Oh well, I’m sure my coach ticket on Swiss Air via Frankfurt and New York will be just fine. And I can’t really blame Google – the entire flight I would clearly have been eavesdropping on conversations, rummaging through papers and unattended laptops, and generally making a nuisance of myself in the search for a good story. They probably would have had to make an emergency landing in Greenland just to kick me off. Then I’d be stuck in Greenland, and I’m not even sure if they have the Internet there. We’ve certainly never covered a startup from Greenland. Update: I caught Tim, Mitch, and Reid leaving the hotel to make the flight. Boy do they look happy.